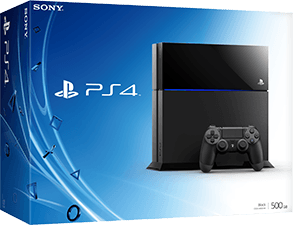 The PlayStation 4 is by far the console that has achieved the most runaway success this generation. Boasting a great catalogue of first-party hits like God of War, Horizon: Zero Dawn and Uncharted 4: A Thief’s End, vibrant HDR graphics in addition to a wholly robust online eco-system that lets you enjoy top-notch multiplayer, Sony continues to give videogame enthusiasts numerous reasons to play on PS4. Jumping on board used to be a simple affair back when the console launched in 2013 as there was only one 500GB model available. 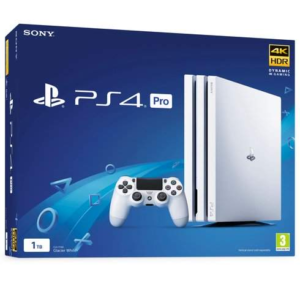 Now, however, potential purchasers need to consider the PS4 Slim and PS4 Pro too, which leaves many asking: What are the different PS4 models? Thankfully that’s where Consoles.com can help, providing all the info and details you need to determine whether the original PS4, PS4 Slim or PS4 Pro is your ideal choice. Whatever your requirements, it’s good to stay informed so you can put the ‘PS4 vs PS4 Pro vs PS4 Slim’ debate to bed for good. 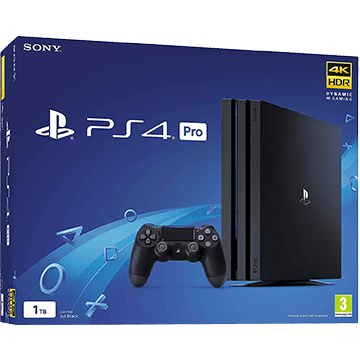 The PS4 Pro is a leaner, more souped-up edition of the original PS4 that was officially released on November 10th 2016. 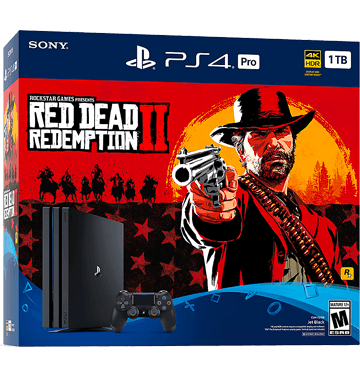 It is the newest (and likely last) version of the console, specifically developed to super-charge everyone’s PS4 experience thanks to a faster graphics processor and built-in support for HDR and 4K-ready TVs. This effectively allows players to experience games with sharper visuals, increased detail and at a much faster framerate. Playing games in true 4K resolution is currently a feature exclusive to the PS4 Pro, but those with a standard HD TV set-up will likely still see a boost in graphical fidelity. HDR, for those unaware, is short for “High Dynamic Range”, which refers to a type of visual improvement that makes the blacks appear deeper and whites appear much brighter. When taken advantage of, games developed with HDR in mind feature images that can seem lifelike when played on PS4 Pro. Some of the most notable games that are enhanced for the PS4 Pro’s 4K capabilities include Red Dead Redemption 2, Marvel’s Spider-Men, Resident Evil 2 and Assassin’s Creed Odyssey. The biggest leap in difference between PS4 models is found when you compare 2013’s 500GB launch PS4 with the PS4 Pro. The former simply isn’t geared towards taking advantage of 4K visuals and HDR, meaning that 1080p output is the best you can hope for with an original PS4. As well as far superior visuals, the PS4 Pro matches the PS4 Slim’s much sleeker chassis design – albeit with one extra tier which helps to indicate the increase in power. The PS4 Pro and PS4 Slim were released within the same 2016 launch window, with the latter eventually replacing the original launch console as the standard model. Both models share a similar tiered chassis design, yet the Slim only has two compared to the Pro’s three. The Slim takes advantage of some HDR capabilities, but only the PS4 Pro offers players true 4K visual output – providing you have a 4K-ready entertainment set-up. Do I need a 4K TV to use a PS4 Pro? – Not necessarily, it works with any HDTV. But, if you do have a 4K TV, then games developed with it in mind will display in 4K, as well as HDR if your TV supports it. Will PS4 Pro play my old PS4 games? – Absolutely. Some will have improved performance as mentioned, but every game in the PS4’s library will play on PS4 Pro. Is it worth getting a PS4 Pro if I don’t have a 4K TV? – If you want to enjoy higher framerates and detail levels when playing your games, then yes. Will PS4 Pro have any games exclusive to PS4 Pro? – Not at all. Sony has made it abundantly clear that all PS4 console models will play all PS4 games. Does PS4 Pro come packaged in with a new DualShock 4 controller? Yes, but it’s only a slight iteration that features a light strip on the front touchpad. What are the hard disk/storage capabilities of the Pro? – It’s currently only possible to get a PS4 Pro with a 1TB hard drive. 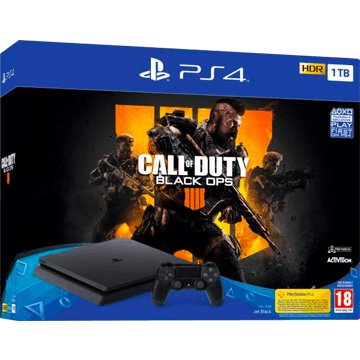 This is if you don’t include the limited edition 2TB translucent dark blue PS4 model released to commemorate 500 million PlayStation consoles sold. Want to experience 4K resolution in your PlayStation 4 games? Here are the best PS4 Pro deals. What is the PS4 Slim? 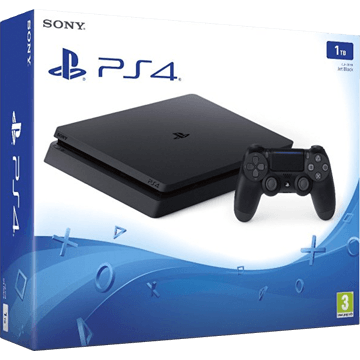 First released on September 7th 2016, the PS4 Slim is the model that eventually went on to phase out the original ‘fat’ PS4 console both on digital and physical store shelves. It is noticeably much sleeker than the launch model’s design but is much easier to clean and maintain as a result, thanks to improved access to the internal fan. As such the PS4 Slim runs much quieter as you play, avoiding the chances of overheating and thereby increasing the model’s lifespan. With regards to performance, the PS4 Slim specification is extremely similar to that of the original PS4. That makes it slower compared to the souped-up PS4 Pro… but all three models still play every PS4 game released. The PS4 Slim, however, brought HDR lighting to all players via a software update released post-launch. The PS4 Slim and PS4 Pro share a similar tiered chassis design, but under the hood is enough difference to prevent the PS4 Slim playing games at true 4K resolution. Luckily, this is the kind of feature that’s only really noticeable when playing the same game side by side, and anyone with a standard HD TV will still see some improvement in terms of HDR. Thanks to the PS4 Slim eventually replacing 2013’s original launch PS4 model, this isn’t really a conversion many people considering buying a PS4 should find themselves asking. For the most part the ‘fat’ PS4 and PS4 Slim share a lot of technical similarities, bar a removed audio out jack input, which most won’t find themselves needing anyway. The PS4 Slim is the most energy efficient model out of all three. How much smaller is PS4 Slim compared to the launch PS4? – About 40% smaller. The PS4 Slim is 264 x 288 x 39 mm, while the original PS4 is 275 x 305 x 53 mm. Are any original features missing PS4 Slim? – Yes, but it’s very minimal. The PS4 Slim doesn’t have an optical audio out jack. Does PS4 Slim have any new elements not featured in the original PS4? – It has a two-tiered, more rounded case design compared to the original’s sharpness. It also features a new version of the DualShock 4 controller. What are the hard disk/storage options? – At first it was only possible to get a 500GB PS4 Slim. Now, however, the newer PS4 Slim models feature up to 1TB of storage. Is the PS4 Slim the perfect choice for you? These are some of the best PS4 Slim deals currently. What about the original PS4? 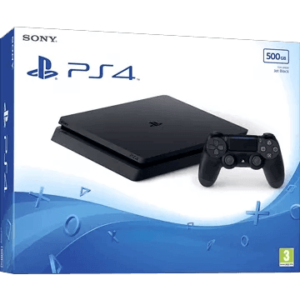 It’d be extremely difficult to purchase an original model PS4 still sealed in its packaging now, given that Sony announced that it had been officially replaced by the PS4 Slim as the standard model as of April 2017. Those original SKU PS4 models should have all but disappeared. This isn’t a great loss as the PS4 Slim and ‘fat’ PS4 are largely identical, other than how much sleeker the later model was designed to be. Is it worth buying an original PS4? The one benefit it used to hold over the PS4 Slim was the extra boost in storage, whereby original PS4 units were available in both 500GB and 1TB variants compared to the Slim’s sole 500GB model. That issue has since been rectified, however, and now the PS4 Slim can be purchased with 1TB of built-in memory. The only way to buy a 2013 model PS4 is to buy one refurbished. Doing so would see you lose the standard one-year guarantee when purchased new. When setting the original launch PS4 against the far sleeker and more powerful PS4 Pro, the difference is night and day. The only realistic scenario in which the two would be compared is if you are considering upgrading to the Pro or Slim from an original. From there it becomes a debate as to whether your TV can take advantage of 4K-enhanced games. If yes, a PS4 Pro makes a lot of sense. Those thinking they’d miss the lack of an optical audio out jack – perhaps, if you’re used to connecting an amplifier – then the original PS4 has a slight leg up over the Slim. 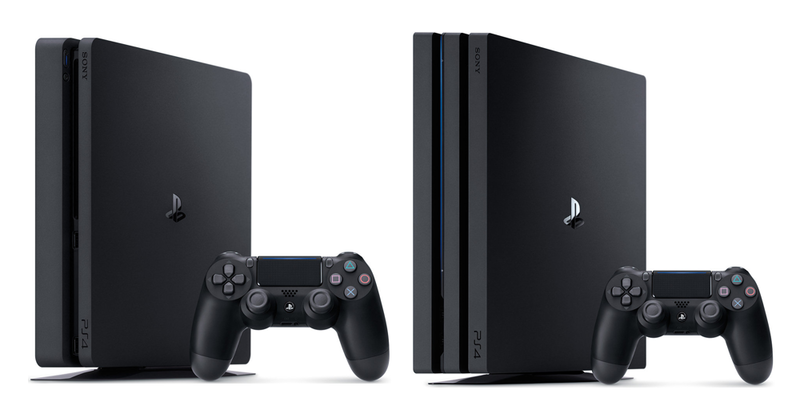 For most, however, the PS4 Slim is the obvious choice to make between these two models. Does the original PS4 play the same games as PS4 Pro and Slim? – Yes, but they won’t be able to take advantage of 4K and HDR visuals. Does the original PS4 support HDR? – Indeed. All PS4s can do HDR graphics in games that support it, thanks to a firmware update released post-launch. Does the original PS4 have any advantages over Slim? – It has an optical audio out connector, unlike the PS4 Slim. What are the hard disk/storage options? – The original PS4 comes in 500GB and 1TB versions. Hopefully this is all the information you need to determine which PS4 you want. All that’s left to do is buy one! PS4 Slim vs PS4 Pro: Which To Buy?